Differences in NASA long term human space exploration since 1989? Establish a long term presence in space via a space station. Do a mission to the Moon, or cis-lunar space, to test out capabilities for a longer mission. Possibly include an asteroid mission. Do a mission to Mars. There has been so far as I can count 4 different versions of that plan, established under Presidents George H.W. Bush, George W. Bush, Obama, and Trump, but they all basically seem to say the same thing when I start looking, except they want to scrap the "overpriced" rocket from the previous administration and start their own. Am I missing something fundamentally, or are all of these programs basically the same thing? My current thinking is there are some elements that are more focused in some versions then others, and some different names given. Here is my version of what the various plans entail, and where they are different. Still a work in progress. Not the answer you're looking for? Browse other questions tagged mars crewed-spaceflight nasa future-missions or ask your own question. 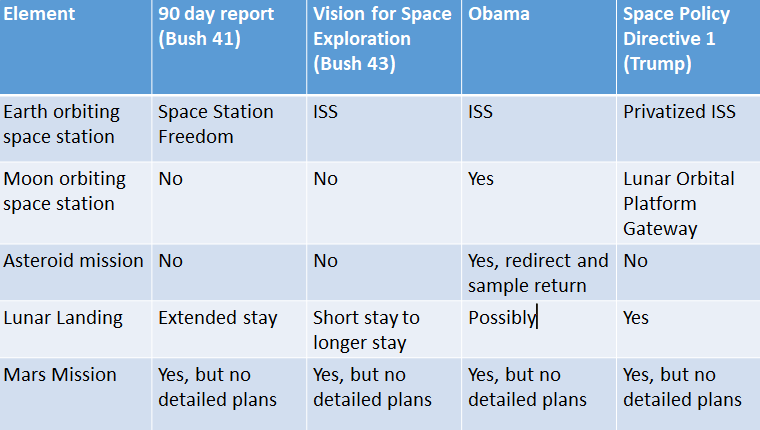 What is the US government's long term vision for space development and exploration? Long term survival at Tranquility base?